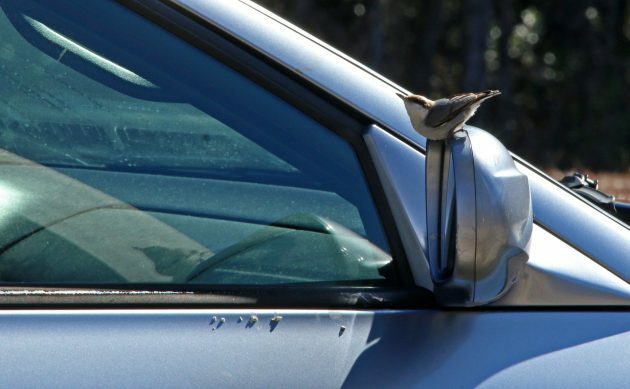 Brown-headed Nuthatch taking on a car mirror. But that was weeks ago! Every day since then the nuthatches have been at it, dominating the parking lot with their antics. A small songbird, the Brown-headed Nuthatch is found throughout the Southeast and grows to be about four inches long. Their brown heads contrast with white chests and blue backs, and because they prefer pine forests, I wasn’t surprised at their presence. Why though, did they suddenly take an interest in their reflections? My guess: the nuthatches are actively seeking and defending territory. According to Mass Audubon: “The root of this behavior is territorial. When birds select a nest site, the surrounding area becomes their territory, and they defend it vigorously. Bird territories vary in size depending on the bird species and available resources. A typical suburban songbird such as an American robin needs only a small backyard, whereas a pair of black-capped chickadees will chase off trespassers in a space from eight to 17 acres.” Brown-headed Nuthatch family groups practice cooperative breeding, and the mating pair as well as their young from previous seasons can band together to fend off intruders. They’re cute though, aren’t they? 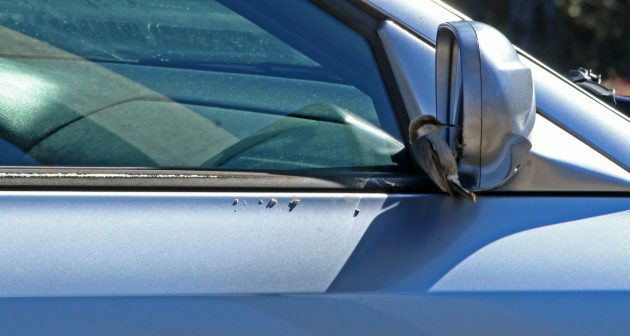 Honestly, despite the droppings they leave on automobiles, the nuthatches are incredibly entertaining to watch. Additionally, the “Brown-headed Nuthatch’s association with pines, particularly mature pines, may make it an indicator species for the health of southeastern pine forests, which have been extensively logged for the last century.” The Choctawhatchee Basin Alliance works in an ecosystem heavily influenced by pine forests, and the nuthatches are a positive sign that management practices are working – at least for this species. 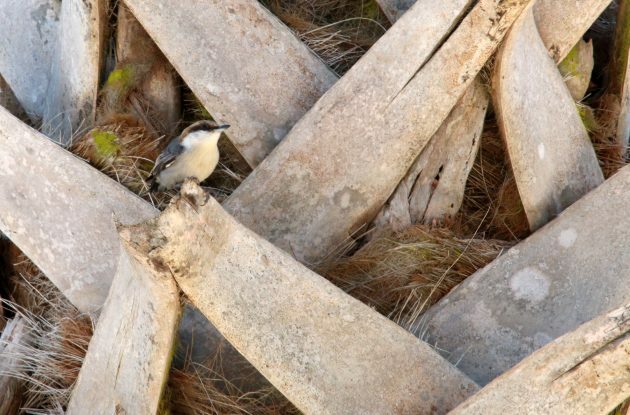 We are in the warmer month of February now, and soon the nuthatches may devote most of their energy to rearing chicks instead of warding of reflection-enemies. While I always root for successful nests, I may miss the hilarious sounds of the nuthatches and their battle cries!